To learn and demonstrate an understanding of the use of drawing tools in Adobe Illustrator. I can use the drawing tools in Illustrator to trace a picture of a submarine. Review the video links in Week 1’s lessons to refresh your memory on the use of the Shape tools, the Brush and Blob Brush tools and the Pen tool. Create a new Illustrator Web landscape-oriented document with all the default settings and one artboard. 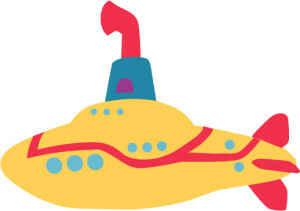 Using the pen tool and techniques demonstrated in the videos and discussed in class, draw the yellow submarine in the picture above. A copy of the image is provided in the link below to use as a reference. Be sure to use closed shapes to make parts of the sub that need to be filled in with color, and use the Object -> Arrange menu to change whether objects are in front or in back of each other. Do your best to make your sub look like the one in the picture, but if you want to change the fill colors, you may do so. (for example, the sub doesn’t necessarily need to be yellow). Good luck and happy drawing!